Modern passenger cars and diesel-engined vans are equipped with a diesel particulate filter. This filter captures air polluting gases from the engine that would otherwise end up in the environment. In the course of time the filter becomes full. The car's electronics ensure that this soot is burned during motorway driving or when the engine is under a heavy load. This is known as regeneration. As a rule the diesel particulate filter is usually regenerated successfully in cars that are used for extended trips on motorways and are regularly driven at higher speeds. This is not the case in cars that are hardly ever or never driven long distances but are mainly used for around-town driving. In this group of cars in particular, the regeneration process is unable to start as the engine does not reach a sufficiently high temperature. Another common problem in these cars is that the regeneration process is started, only for it to be cut off prematurely because the destination has been reached before the engine temperature is sufficient. If cleaning the diesel particulate filter fails repeatedly, the engine will begin to lag and ultimately enter the so-called limp mode, causing the diesel particulate filter system warning light to light up. A car that has entered limp mode can be driven to a garage in order to be checked. Never keep driving the car for any extended period of time once the limp mode is active, as this may result in costly damage to the engine. When the diesel particulate filter system develops a fault, affordable fixes are available so it is important to get to a garage as soon as possible. JLM Diesel Particulate Filter Cleaner (DPFC) J02210 is a sustainable solution for the effective and efficient cleansing and preventative cleaning of the entire exhaust system of diesel engines with a diesel particulate filter (DPF). 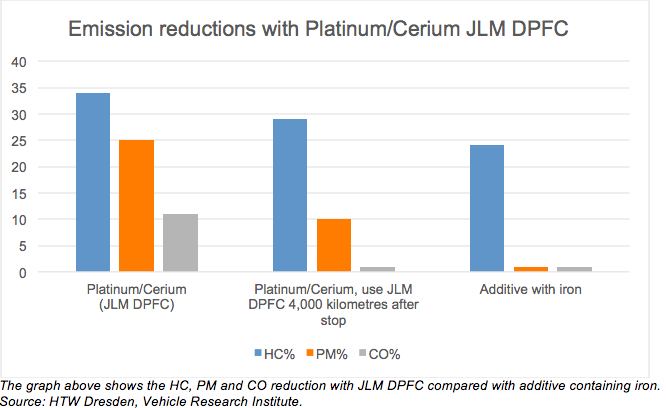 JLM DPFC not only cleans the DPF, it also reduces air-polluting fine particles of hydrocarbons (HC), carbon monoxide (CO) and soot emissions. This is why JLM Diesel Particulate Filter Cleaner could mean the difference between passing and failing the MOT test. JLM Diesel Particulate Filter Cleaner reduces soot and fine particle emissions by up to 25 percent. This means less soot is deposited in the DPF, reducing the risk of blockage and increasing the service life of the filter. Unlike conventional additives, JLM Diesel Particulate Filter Cleaner conditions the engine and the DPF using so-called ‘catalytic materials’. This allows the engine to perform better and reduces fuel consumption. But just how do the additives actually work? Almost all manufacturers of conventional additives add cerium and iron particles to their additive to initiate the self-cleaning process in the DPF. The more iron contained in the additive the greater the amount of soot that is burned. This is why most manufacturers add as much iron as possible to their additive. A disadvantage to burning iron is, however, that ash is created during the burning process. On the one hand the additive does burn the soot, but on the other hand it is replaced by ash. This means: the greater the amount of iron the greater the amount of ash left in the DPF. And in the long run ash causes blockages which cannot be regenerated; you can’t burn ash after all. Moreover, the presence of ash means that the DPF is cleaned less effectively. 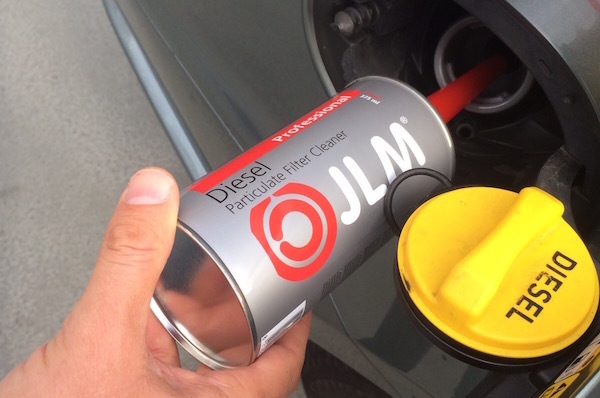 JLM Diesel Particulate Filter Cleaner comprises a patented platinum-cerium compound. The JLM DPFC encapsulates the soot particles in the DPF. As a result of the platinum-cerium compound the soot particles are burned at a lower temperature and burn much earlier and quicker. Because of these properties the combination of platinum and cerium ensures significantly better regeneration and therefore cleaning of the DPF in comparison with conventional cleaners. Another advantage of JLM DPFC is that the additive initiates cleaning of the DPF at a much lower temperature than conventional additives. So even during short trips at lower speeds, for example, during around-town driving. When using conventional additives containing iron the regeneration still has to be initiated using a diagnostic tool or by a trip at considerable speed on the motorway. This is a time-consuming task. 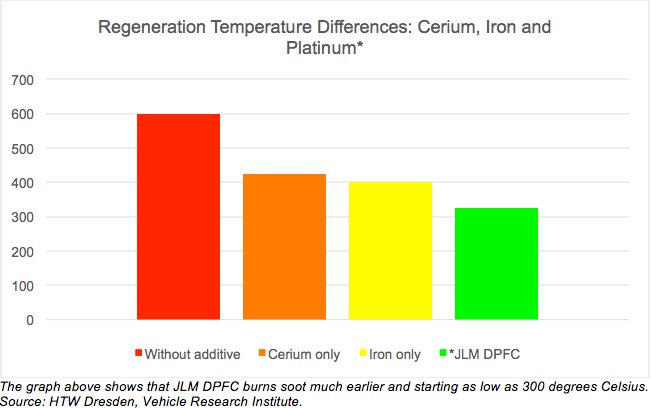 As a result of the JLM cerium-platinum formula less ash will form and be deposited in the DPF. This means that the DPF will not become blocked as quickly and will have a longer service life. To prevent ash in the DPF manufacturers of conventional DPF cleaning additives reduce the amount of cerium and iron in the additive. This results in a dramatically poorer regeneration performance. JLM Diesel Particulate Filter Cleaner (DPFC) is a technologically advanced Fuel Borne Catalyst (FBC). Fuel Borne Catalyst is an additive that encapsulates harmful fine particles (particle matter - PM) and soot as a result of which it burns at a lower temperature and therefore sooner during the car management system’s regeneration process. In addition, JLM Diesel Particulate Filter Cleaner optimises the compression in the combustion chamber reducing the emission of exhaust gases. Ensures complete DPF regeneration under unfavourable regeneration conditions. Reduces the risk of incomplete regeneration and blockage of the DPF and so prevents the vehicle having to be taken to the workshop for unexpected repairs. Conditions engine and DPF components with platinum, improving performance. The platinum protects the conditioned engine components for up to 4,000 kilometres, even if the fuel company has not added any protective additives to the diesel fuel. The conditioning period takes a while, so we recommend using the product regularly. Reduces fine particles (particle matter - PM) by 20 to 25 percent. This is much more than with conventional DPF cleaning additives and especially if JLM Diesel Particle Filter Cleaner is used regularly. As a result of the lower PM emissions fewer fine particles are deposited in the DPF. Up to eight percent fuel savings for diesel powered vehicles (depending on the engine and use). Extremely effective at reducing other engine emissions such as hydrocarbons (HC) and carbon monoxide (CO). JLM Diesel Particulate Filter Cleaner is proven to be suitable for passenger cars, light commercial vehicles and heavy duty diesel retrofit systems. JLM Diesel Particulate Filter Cleaner meets the requirements set by the European VERT and the American EPA concerning protection of public health and environmental protection.